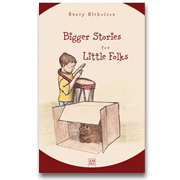 We are pleased to announce the release of Bigger Stories for Little Folks, a comfortable ‘half step’ between Little Stories for Little Folks and Devotional Stories for Little Folks. The ‘Greg stories’ in this volume reinforce all the lessons of Little Stories for Little Folks, providing extra phonics and reading practice for those who need a little more, and pure enjoyment for those early readers who can’t wait to read a ‘real chapter book.’ Stories are longer than those in Little Stories for Little Folks, but shorter than those in Devotional Stories, offering a comfortable transition between instructional phonics and higher level reading. Each story is introduced with word attack and ‘sounding out’ exercises, designed to enhance reading proficiency. Successive stories include vocabulary and phonics or letter combinations introduced in the preceding story for gentle review. Twenty-one chapters in all! Softcover. 122 pgs. 5½"x8½"